One important right in conjunction with personal rights here in Germany is the “right in one’s own picture”, which means that no one is allowed to take a picture of you and publish it without your permission. 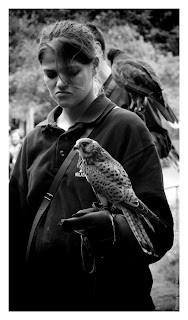 I ran into that problem last week when I visited the Munich zoo and took some images at the bird of prey show. While at the zoo I didn’t controlled the images, so I get aware of the funny content when at home and editing the pictures.